Two recent emails nudged me to write this post. The first came from a friend in Australia. Her parish is participating in an inter-faith dialogue, and she was asked to lead a prayer service for an upcoming meeting. The second came from an unknown person in the form of a letter to Benedict XVI, written in Italian. I receive a lot of international emails through my work, so can`t always assume they are spam. But, a quick scan through my trusty Google Translator showed the ramblings of a real nut-job. The author was protesting the upcoming beatification of Pope John Paul II. One of the reasons for his protest was the 1986 World Day of Prayer for Peace in Assisi that JPII had organized and attended. I remember well the wonderful photographic images of the Assisi gathering. 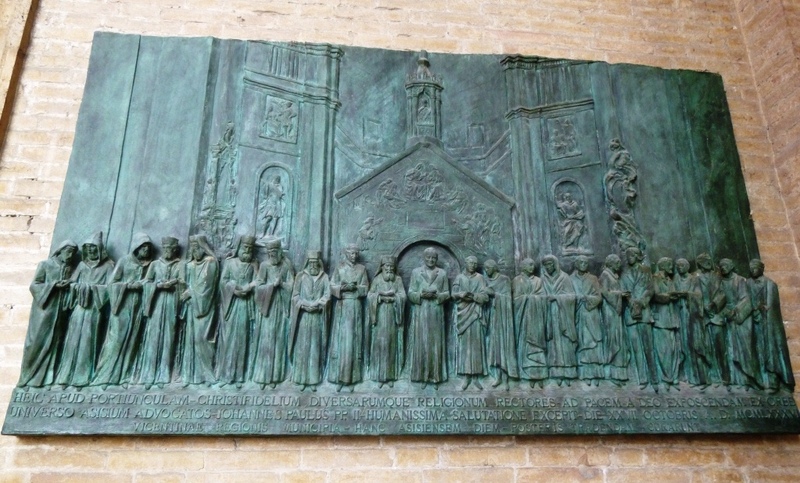 On a visit to Assisi last year, I took a photo of a bronze relief that depicts this momentous occasion. It was inspiring to think of all faiths gathered to pray in their own tradition – a spiritual all-stars game of sorts! The author of the wacky email went so far as to call JPII the anti-Christ for this `heretical` act. I feel genuinely sorry for this poor soul. The shadow side of deep commitment is the darkness of hate for the other. We see it in fundamentalism of all kinds. Rays of hope come from all corners of the world where religious leaders and persons of diverse faiths are gathering to meet, to dialogue, and to pray. The only hope we have for peace in this world is the joining of minds, hearts, hands…and souls.